A Marketing Offer Gets Motion. Your marketing offer needs to be compelling enough to get your customer or prospect to take action. 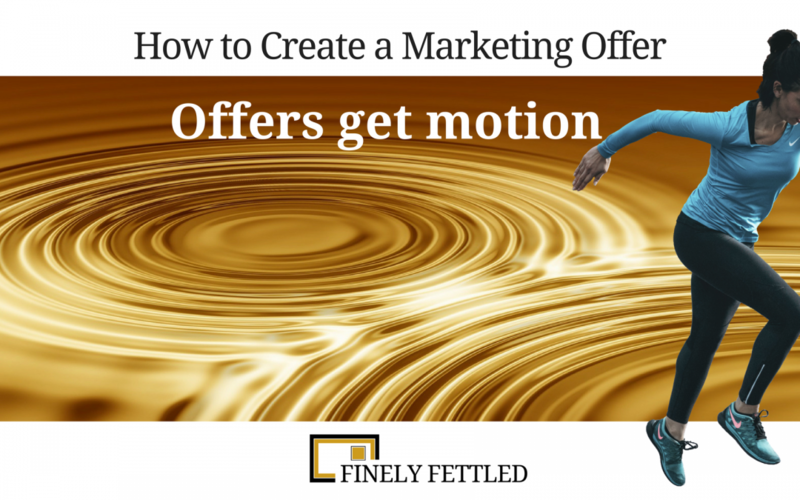 In particular, your offer needs to get prospects into motion in two directions. You want your best prospects moving towards you and those who are unsuited moving away from you. A good marketing offer both attracts and repels. How will your marketing offer be valuable to your customers and prospects? To be valuable, your offer should address the problems, needs, interests and desires of your prospects and customers. Offers raise response rates to your mailings. Simply by including a free report, or invitation to a seminar or webinar, you can often double your response rate, when compared to a similar mailing without such an offer. The free trial removes the risk for your prospect. And if they are taking too long to make up their minds, then a free trial offer can help remove their procrastination. The same can be said for the money-back guarantee. This might be the final piece of the jigsaw that the prospect needs to reassure themselves that they are making the right decision to buy from you. Free gifts have the benefit that they are perceived as more valuable than the equivalent cash amount. A gift is more tangible and with a little thought can elicit an emotional connection with your prospect or customer. I’m indebted to GKIC (https://gkic.com) for the Offer Generator formula. The adjective should describe how awesome your offer is. It may be new, free, easy, advanced, money-saving or step-by-step! The next bit is the key problem (the problem you know your potential audience has, like an under-performing investment portfolio) or solution (what your company does to eleviate or rid the problem for the customer or prospect). Another client of mine helps people to sell their home quickly for full market value or they’ll guarantee to buy the property. The noun could be assessment, sale, package, gift, toolkit, or formula. There are lots of nouns so there are plenty of options that will make your marketing offer’s name truly unique and memorable. So imagine you were to accept my Ultimate “What Happened to My Mailing” Assessment. What would be the prospect’s big win? If I had to write down the transformation the prospect would go through once they had received the Assessment, that description would be how they’d be transformed as a result of the knowledge offered. The prospect might have been bemused with the results of their previous mailing. The mailing might have been expected to perform at a much higher level. So, what went wrong? The transformation after an assessment, which is qualitative, provides real evaluation, would point out the wood from the trees. The transformation is therefore insight. It’s free research that can help the prospect make better decisions. Of course, from the assessment provider’s point of view, the exercise is an excellent way to demonstrate marketing consultancy, or lead generation mastery, or direct mail consultancy knowledge. The assessment brings the prospect towards the assessor and they both feel more positive because of the exercise. The advice here then is to focus on the TRANSFORMATION your prospect or customer experiences. The big win for a person that experiences a mailing assessment is that their next campaign can learn from the issues found and produce better financial results. Refer a friend and receive XYZ. If you have described your offer already, because you are offering something for free, then this part is done. However, you need to add the total price required for your prospect or customer to accept the offer. That might be £999, for instance, or 3 payments of £333 etc. Your offer should include some form of scarcity to stimulate an immediate response. Limited availability – is your premium, discount or rebate limited by availability? Stick in a hard deadline to convince the prospect that they had better get their skates on to take advantage. Premium versus discount? – Premiums, like packaged deals are more likely to attract urgency than a simple discount. This is especially the case if you are marketing to the affluent. Nothing destroys value quicker than a random act of price discounting on an upmarket product or service. Can you offer some form of exclusivity, which by definition is limited in supply and might only be available for a short period? Can you offer an exclusive experience that would deliver a higher level of satisfaction, particularly if only 50 desirable units of your premium product or service would ever be released? I could increase the potential appeal of the Ultimate “What Happened to My Mailing” Assessment by limiting the quantity available. Once they have gone, they have gone. There is evidence that the human mind can cope with about 4 things at a time, plus or minus a couple. So, focus on getting 3 good descriptions of your features and benefits. So, how about 3 features and benefits for The Ultimate “What Happened to My Mailing” Assessment? 1. Know what works and what doesn’t, so your future campaigns yield the very best results for your livelihood. 2. Build on your success with a dispassionate review that can say the things you might not wish to admit to yourself. 3. Avoid your review being subject to personal opinions when you can reference expertise borne of long years of trial-and-error experience. Therapist: “Get immediate access to our private Facebook group where therapists and members will answer your questions and give you encouragement”. If you dont get this part right, then pretty much all of the above is superfluous! Help your prospect and customer by explaining in detail exactly what they must do in order to take advanatge of your offer.